The Lisbon Area Historical Society will be presenting a panel discussion of past and present life on area farms at 1:00pm on Saturday January 19th at the Shared Ministry's White Church on South Main Street in Lisbon. The Historical Society will prior to its program on farming be holding a brief annual meeting of its members and election of officers at 12:30pm, and all others attending the event are welcome to be present for the Society's meeting. Farming has for over two centuries been a prominent aspect of life in our three towns of Lisbon, Landaff and Lyman and the surrounding region. We are very pleased to have a panel of speakers who have as farmers lived on and experienced all aspects of farm life in the local area. The Historical Society's panel of present or former farmers speaking about "Down on The Farm - Then and Now" will include Richard Bronson, Douglas Erb and Douglas Heath - all residents of Landaff - and Russell and Mary Hicks of Littleton. The presentation will include histories and pictures of early settlers and descendants, and recollections of childhood before electricity and telephone. Discussed farming activities will include milking by hand and the advent of machinery and haying up to 15,000 bales. Farming was a way of life in rural New England, and our towns were no exception. Many families in villages like Lisbon even kept a milk cow and chickens as sources of food for themselves. Sheep farming to produce wool was common until the mid-1800's. However, dairy farming became the big local business when the arrival of train service in the 1850's gave local farmers over-night access to the growing Boston market for milk and other dairy products. This program is free and open to the public, and light refreshments will be available. Those attending will be encouraged to share their own experiences in the discussion to follow. For more information regarding this event, contact Dori Hamilton at 838-5149 or email info@lisbonareahistory.org. Please join us to see and hear the talk and film presentation by Richard Nevell of "A History of American Country Dancing" on Thursday September 27th at 7:00 PM at the Shared Ministry’s White Church at 49 South Main Street in Lisbon. "Country dancing has always been one of the most exhilarating ways to bring people of every race, religion, gender and socio-economic group together in a traditional art form," says our program director Dori Hamilton. "In New Hampshire, country dancing has been enjoyed since colonial times." Nevell, an educator, author, artist and producer, has appeared on NHPR's "Word of Mouth", VPR's "Vermont Edition" and ABC-TV's "Good Morning America". On this special evening in Lisbon, he will present a history of American country dancing and will show segments of his two films "Country Corners" and "Full of Life A-Dancin". Both films are based on his book "A Time To Dance: American Country Dancing From Hornpipes To Hot Hash". Following the film screenings, Mr. Nevell will answer questions from the audience. His book and DVD will also be available for purchase. There may even be an opportunity to learn some "dancin'". This evening program of enlightenment and entertainment is free and open to the public. Light refreshments will be served. For more information, contact Dori Hamilton at (603) 838-5149 or e-mail info@lisbonareahistory.org.
" BREWING BEER IN NEW HAMPSHIRE-An Informal History of Beer in the Granite State Through Colonial Times to the Present"
Beer has been brewed in New Hampshire from 1635 at Strawbery Banke - now Portsmouth - through the present day here in the North Country. This fascinating history and society's changing attitudes will be the topic of a Lisbon Area Historical Society presentation by Glenn Knoblock on Wednesday, June 13 at 7 PM at the Shared Ministry's White Church on South Main Street in Lisbon. The Lisbon Area Historical Society has received a grant from New Hampshire Humanities to present Mr. Knoblock and his program "Brewing In New Hampshire: An Informal History Of Beer In The Granite State From Colonial Times To The Present". Knoblock is an independent scholar and author who will share his extensive knowledge about home- and tavern-based brewing as well as modern breweries and brewpubs. Unusual and rare photos and advertisements will depict this ever-changing industry and its characters. These include the infamous Frank Jones from Portsmouth, a woman who operated a brewery before the modern era, the Anheuser-Busch regional brewery, and more recent North Country breweries. This program is free and open to the public. Light refreshments will be served. Those with required ID may even have the opportunity to taste a bit of this New Hampshire history. For more information, contact Dori Hamilton at (603) 838-5149. Learn more about New Hampshire Humanities and its goals of nurturing learning and inspiring community engagement by contacting www.nhhumanities.org. The Lisbon Area Historical Society is dedicated to preserving and sharing the history of the towns of Lisbon, Landaff and Lyman and informing the public about this area. LISBON AREA HISTORICAL SOCIETY PRESENTS "NEW HAMPSHIRE ROADS TAKEN - OR NOT"
How have decisions to build highways and improve existing roads influenced the economy and people of New Hampshire towns? This will be the topic of a Lisbon Area Historical Society presentation by Steve Taylor on Wednesday, April 18th at 7:00 PM at the Shared Ministry's White Church on South Main Street in Lisbon. Taylor, a resident of Meriden, New Hampshire, is an independent scholar, farmer, journalist and longtime public official, having served as the New Hampshire Commissioner of Agriculture for 25 years. Following World War II, New Hampshire embarked on an extensive program of constructing new highways and improving existing roads to accommodate the explosive growth in passenger vehicles and the need for better infrastructure for commercial traffic. Decisions were influenced by local and political considerations as well as by policy from Washington. Frequently the choices would generate much conflict and controversy. The outcomes would come to have profound and lasting impacts upon the communities and entire regions of the state. The Lisbon Area Historical Society has received a grant from New Hampshire Humanities to present this program. The event is free and open to the public. Light refreshments will be served. New Hampshire Humanities nurtures the joy of learning and inspires community engagement by bringing life-enhancing ideas from the humanities to the people. Guest speaker will be Dayton Goudie, pictured below continuing research in his Littleton, N.H. home. Dayton Goudie of Littleton will be speaking about the history of his family at the Shared Ministry's White Church in Lisbon on Wednesday, January 17th beginning at 7:00 PM. His talk will focus on the short life of his great uncle Clark Goudie who grew up in Lisbon and after attending college died a century ago in service to his country in Europe in World War I. "We are very much looking forward to Dayton's public presentation on the evening of our annual meeting," said Judy Boulet, Vice President of the Lisbon Area Historical Society. "Those attending will have an opportunity to learn about the interesting life of Clark Goudie and also about what life was like for the Goudie family and others in the Lisbon area at the beginning of the Twentieth Century." Dayton Goudie - like his great uncle Clark - lived most of his life in the Lisbon area where his father was for many years in the hardware business. After graduating from Lisbon High, Dayton served in the army and after college taught vocational agriculture for many years at White Mountain Regional High School. Now retired, he lives on Partridge Lake in Littleton where his family in 1920 purchased property and thereafter spent their summers. In 2016, Dayton's friends George and June Paige found in their barn in Lisbon and delivered to him a trunk that was jammed full of written and other materials of and about the brief life of Clark Goudie. "Up until that moment, I knew quite a bit about most of my family but very little about Clark," said Dayton. "The arrival of that trunk started me on the interesting and challenging process of learning a lot more about him and those close to him." The brief period of Clark Goudie's life in the early part of the last century was a time of considerable activity in the Lisbon area. The driving forces were several manufacturing plants, many dairy farms producing milk mostly for the Boston market, and a bustling Main Street retail center. In 1910, the total number of residents of Lisbon, Lyman and Landaff peaked at 3,560 - 30% greater than the current population of the three towns. "Dayton's talk on the life of his great uncle Clark will help us better understand what life was like in this area a century ago," said the Society's Historian Andrea Fitzgerald. "We are also hoping that his report on his research will encourage others to embark on the rewarding process of digging into the history of their own families." The Lisbon Area Historical Society will prior to Dayton Goudie's presentation be holding a brief annual meeting of its members beginning at 6:30 PM, and members of the public are welcome to be present for the Society's meeting. "The folks who come early will learn more about our Historical Society and be rewarded with a chance to enjoy the free dessert treats and other refreshments that we will be making available," said Boulet. For more information regarding this free public event, contact the Historical Society's Program Chair Beverly Pelletier at (603) 444-3964 or e-mail info@lisbonareahistory.org. The Society is grateful to the Shared Ministry for making its first-floor meeting space available for this special event. The Lisbon Area Historical Society has received a grant from the New Hampshire Humanities Council to present a talk by scholar and author Glenn Knoblock on historic and unusual weathervanes in the Granite State. This program, which is free and open to the public, will take place Wednesday, September 27th in the Shared Ministry's White Church on Lisbon's South Main Street beginning at 7:00 PM. Refreshments will be served. "We are very pleased to be hosting Glenn Knoblock's interesting presentation on weathervanes," said Historical Society President Dorothy Wiggins. "Most of us know very little about the weathervanes that have for more than two centuries been a visible part of life in our state." Weathervanes have been found on New Hampshire's churches, town halls, barns and other buildings from earliest times. Mr. Knoblock will trace the history of weathervanes, their practical use and interesting symbolism. He will also discuss their varied types of manufacture and evolution from practical weather instrument to architectural achievement. "Making farming and other outdoor plans for the next day or two was not so easy before detailed forecasts became available via radio, television and now the Internet." said the Society's historian Andrea Fitzgerald. "During those earlier times, the weathervane was much more than just an interesting decoration." 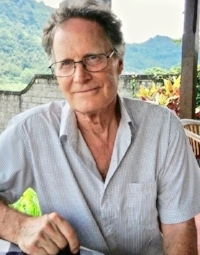 Glenn Knoblock is an independent scholar and author of fifteen books and over 100 articles. He has written and presented on a variety of historic subjects, including Northern New England bridges, New Hampshire cemeteries, brewing in the Granite State, and the service of African-Americans in the military. New Hampshire Humanities nurtures the joy of learning and inspires community engagement by bringing life-enhancing ideas from the humanities to the people of New Hampshire. They connect people with ideas. Learn more at www.nhhumanities.org. For more information, contact the Historical Society's Dori Hamilton at (603) 838-5149 or e-mail info@lisbonareahistory.org. The Lisbon Area Historical Society is dedicated to preserving and sharing the history of the towns of Lisbon, Landaff and Lyman and providing the public with information concerning the history of our region. THERE WAS A SPECTACULAR TURNOUT FOR OUR ANNUAL MEETING AND FREE PUBLIC PROGRAM, "SHEEP TO SHAWL" PRESENTED BY LISBON SHEEP FARMER DORI HAMILTON. A FULL HOUSE ENJOYED LEARNING ABOUT THE HISTORY OF SHEEP AND SHEEP FARMING AS WELL AS THE PROCESS OF PREPARING WOOL FOR A MULTITUDE OF USES. DORI ALSO HAD A VERY LARGE EXHIBIT OF ITEMS FROM HER OWN COLLECTION AND TREATED THE CROWD TO A SPINNING DEMONSTRATION AS WELL. THANK YOU TO DORI AND TO THE THE LISBON-LANDAFF SHARED MINISTRY FOR THE USE OF THE MEETING SPACE IN ITS WHITE CHURCH IN LISBON. PLEASE CLICK ON "ABOUT US" AT LEFT TO SEE A LIST OF OUR NEW OFFICERS AND TRUSTEES ELECTED AT THE JANUARY 18, 2017 ANNUAL MEETING.. To see more photos from Dori's program, click on "PROGRAMS AND EVENTS" at left. Wednesday, January 18, 2017 at 6:30pm - Our Annual Meeting, followed at 7pm with a free special program "SHEEP TO SHAWL," presented by Dori Hamilton. PLEASE JOIN US AT OUR ANNUAL MEETING - WEDNESDAY, JANUARY 18, 2017 at 6:30pm at The Shared Ministry's White Church on South Main Street in Lisbon. We will elect new officers and trustees for 2017, and after the brief business meeting Dori Hamilton, sheep farmer, spinner, knitter, and owner of Tranquil Vewe Croft in Lisbon, will share her knowledge during her program, "Sheep to Shawl." Dori will be speaking on the history of sheep farming and displaying her wool creations and skills.The program is free, and everyone is welcome. Bring a friend. Refreshments will be served. Dori Hamilton of Lisbon will be presenting her program "Sheep to Shawl" on Wednesday, January 18th at the Shared Ministry's White Church on South Main Street in Lisbon beginning at 7:00 PM. Her presentation on the history of sheep and wool throughout the ages and its influence in New Hampshire will be a free public program of the Lisbon Area Historical Society. We are delighted that Dori will be the featured speaker on the occasion of our annual meeting," said Historical Society President Andrea Fitzgerald. "Sheep farming has played a major role in the history of our local area, and Dori is uniquely qualified to give the full picture of the journey of wool from our farm fields to the warm garments that get us through North Country winters." Dori Hamilton was only five years of age living in Pennsylvania when her German grandmother taught her how to knit. However, it was not until after she retired from an extraordinary world-wide career as a Navy nurse - including serving Presidents and families as a member of the White House medical staff - that she was able to give her full attention to raising sheep and making beautiful things from their wool. "I was attracted to New Hampshire and Vermont as a place to retire and raise animals," she said. "The people of the Lisbon area were very welcoming, and in a short while I was busy on my own farm breeding and raising as many as fifty-five sheep." Since acquiring her sheep farm in Lisbon in 1995, Dori Hamilton has become a one-person local sheep and wool enterprise with the help of friends and neighbors when needed. The sheep currently on her farm yield about ninety pounds of raw wool annually. Dori then creates from her wool beautiful and comforting works of art. Her hand-spun skeins of yarn, clothing and other beautiful creations are enjoyed by her family, friends and customers at local outlets and shows. Those attending her presentation on January 18th will have an opportunity to see examples of such items on display and view her spinning demonstration. For more information regarding this event, contact the Historical Society's Program Chair Beverly Pelletier at (603) 444-3964 or e-mail info@lisbonareahistory.org. The Society is grateful to the Shared Ministry for making its first-floor meeting space available for this special event. WEDNESDAY, JUNE 15, 2016 at 6:30pm, at the White Church on South Main Street in Lisbon, Lisbon Area Historical Society will host the New Hampshire Humanities Council program, "History of Dog Sledding and the Role of New Hampshire's State Dog the Chinook," by Bob Cottrell. This FREE program is made possible through a grant from New Hampshire Humanities Council and is open to the public. Refreshments will be served. 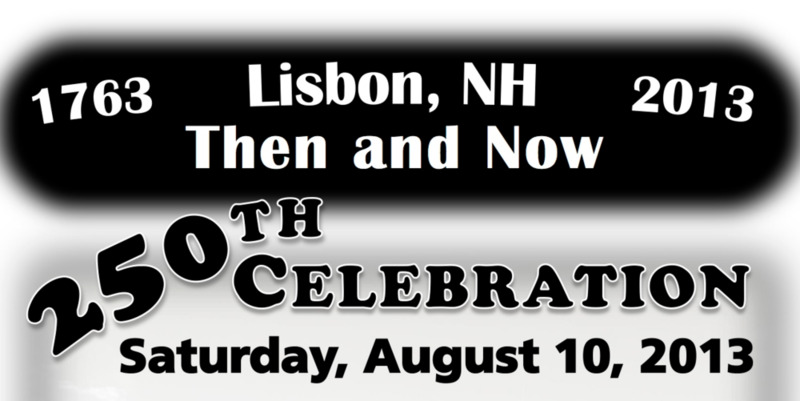 For more information, email info@lisbonareahistory.org or call 603-444-3964. Bob Cottrell is pictured below with his Chinook, "Tug." Click on Programs and Events at left for more pictures. WEDNESDAY, JUNE 1, 2016 at 6:30 pm, Lisbon Area Historical Society President, Andrea Fitzgerald, will be the featured speaker at the first program during this summer's Littleton Public Library Summer Author Series hosted by the local publishing company, Bondcliff Books. Andrea will be speaking about her book, Celebrating 250 Years, A Pictorial History of Lisbon, Lyman, and Landaff, New Hampshire, written on behalf of the Lisbon Area Historical Society and published in 2013. She will share dozens of images from her book, such as the rare image below. The program will be held at the Littleton Public Library on Main Street in Littleton, N.H. The program is free and open to the public. For more information, please call the library at 444-5741. Sprinkling Lisbon's dirt Main Street with water in the late 1800s - this and many other great images will be shown during Andrea Fitzgerald's program based on her book at the first program of this year's Littleton Public Library Summer Author Series. c. 1913 Class Picture of Business Leaders of Lisbon, N.H., by Lisbon photographer Irving James. Click on story below (under Recent News) about these men and their part in the tremendous growth of Lisbon from 1850 into the early 1900s. One of many interesting items in our collection: c. 1800s keys to the Moore Peg Mill. Read more about our amazing collection below (under Recent News) by clicking on the Do You Know What's In Our Museum? article. Business Leaders of Lisbon, N.H. - 100 Years Ago! DO YOU KNOW WHAT'S IN OUR MUSEUM? THE BALLAD LIVES! - In celebration of summer song, Poet, Balladeer, and former Portsmouth Poet Laureate, John Perrault will present a free program of traditional and original ballads along with New England story songs at the Shared Ministry’s White Church on Main Street in Lisbon on Wednesday, July 15 at 7pm, hosted by Lisbon Area Historical Society in conjunction with NH Humanities Council. Refreshments will be served. Attend our public programs and events concerning the history of the area. Purchase books and maps on our area history published by the Society. View items from our growing Collections in person or online via the Internet. Donate documents, photographs and other items of historic importance. Make financial contributions to support the Society's programs and mission. Other Historical Society Things to See and Do! As an active participant in the new www.whitemountainhistory.org project, the Society has put online images of many items from our Collections, including several 19th Century houses in the area. To see those images, go to http://www.whitemountainhistory.org/Lisbon_Area_HS.html. For more information, see "Collections". Our books and maps (Great Gifts!!!) can be purchased at our public events or by contacting us at any time. To see these items and how to acquire same, go to "Publications". Please contact us if you are interested in becoming involved in the work of the Society or have any questions regarding our organization. We welcome any suggestions as to how the Society might better achieve its goals.